According to the United Nations, there are more refugees in the world today than at any point in recorded human history. At the end of 2014, almost 60 million people were forcibly displaced, nearly three times the number recorded just a decade earlier. On a global scale, one out of every 122 people is now either a refugee, internally displaced, or seeking asylum. A majority (51%) of refugees are below the age of 18. Millions have been made homeless and thrown into grinding poverty as a result of imperialist-backed wars in Afghanistan, Iraq, Syria, and Libya. The world’s largest refugee crisis is centered on Syria, where the number of those fleeing to other countries has now exceeded four million. Those able to do so seek refuge in Europe, which often involves a perilous trip across the Mediterranean, a journey that’s taken the lives of thousands of men, women and children. Only this week, the bodies of 49 migrants were discovered inside the hold of a fishing boat, having died of fume inhalation, adding to the total of more than 2,300 who have perished at sea so far this year. Frontex, the European Union’s border agency, reported that 107,500 migrants were detected at its frontiers last month, three times as many as in July 2014. 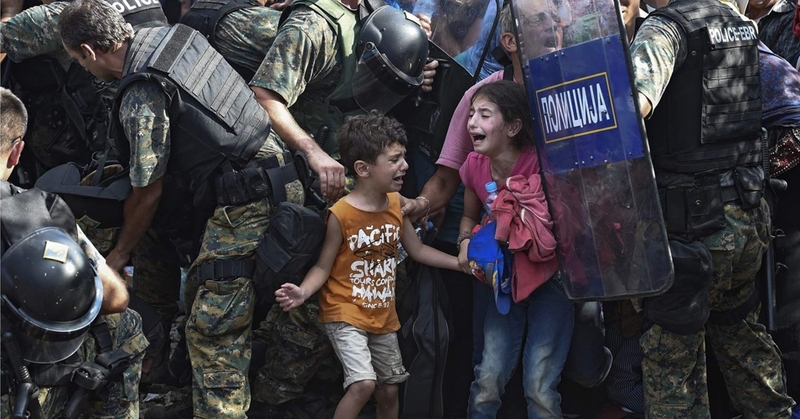 Thousands of refugees and asylum seekers, the vast majority fleeing the war zones of Syria, Afghanistan, and Iraq, attempt to reach Europe via its southern states of Greece, Italy and Spain. Since January, a total of 160,000 refugees and migrants have arrived in the various Greek islands, with more than 20,000 arriving last week alone. More than 100,000 have been rescued and brought to Italy this year. Millions of refugees from Syria survive in massive city-sized refugee camps in Jordan and Turkey. The refugees who attempt the trip to Europe are those who have managed to scrape together enough money to pay one of the traffickers operating the boats. This relatively small percentage of the world’s refugees is treated as an existential threat by Europe’s ruling elite. Refugees and migrants are routinely denounced and cast as criminals, responsible for all of society’s ills, by governments and political parties of all stripes. Speaking of just 5,000 migrants who live in appalling conditions at the port of Calais, UK Foreign Secretary Philip Hammond said, “Europe can’t protect itself and preserve its standard of living and social infrastructure, if it has to absorb millions of migrants from Africa.” This week German Chancellor Angela Merkel warned in a TV interview that the arrival of thousands of refugees to the shores of the continent would “preoccupy Europe much more than the issue of Greece and the stability of the euro.” In Greece itself, the brutal treatment of refugees by the pseudo-left Syriza government is confirmation, if it were still needed, of its pro-capitalist, anti-working class character. The right-wing bile emanating from official circles is echoed and magnified in an outpouring of increasingly overt xenophobic hatred hurled at refugees and asylum seekers by a hysterical media. Rightwing and fascist bands, encouraged by this atmosphere, have stepped up attacks on refugees and asylum seekers. In Germany, for example, more than 200 incidents, including arson attacks on migrants’ homes, have been reported this year. Muslims in particular face the force of this venom. This week the government of Slovakia, which is to receive just 200 Syrian refugees as part of an EU relocation scheme, said it would only accept Christians. What’s being cast as a “migrant problem” is in fact a problem of the capitalist system. There are two root causes of the massive refugee crisis. The first is the growing number of predatory wars being conducted by imperialist powers and their proxies. Indeed, the United States, backed by its allies, has now been involved in a perpetual war since 1991 that’s displaced entire populations and destroyed entire societies. The second major factor is the control and economic destruction of the planet by the major capitalist states that’s plunged billions of people into abject poverty. The European powers seek to insulate themselves from the results of the carnage they’ve wrought through the creation of a “Fortress Europe.” At its June emergency summit on refugees, in the face of growing public revulsion at the deaths of thousands in the Mediterranean, the EU refused to set any quotas for countries to take in refugees, agreeing to relocate just 40,000 of those already in Italy and Greece. All efforts are concentrated on strengthening border controls. Hungary’s southern border marks the edge of the EU’s Schengen Zone of passport-free travel. The rightwing government there is building a massive fence along its 109-mile border with Serbia. This week a prime ministerial spokesman said that the fence would be “defended” by thousands of police against “increasingly aggressive” migrants. New meters-high fortified border fences, miles in length, have been built and strengthened by Greece, Bulgaria, Spain, the UK at the Channel Tunnel port of Calais, and by other countries. Under conditions in which the global economy is more closely interconnected and more complex than ever before in history, the capitalist system, based on the outmoded division of the planet into antagonistic nation states and private ownership of the means of production, is creating hell on earth. Here are 5 things everyone should know about what is happening in Syria now. 1 – The Syrian regime of Bashar al-Assad is killing at least 7 times more civilians than Isis. 2 – More than 11,000 barrel bombs made of scrap metal and high explosives have been rolled out of regime helicopters onto hospitals, homes and schools since the UN banned them. These aerial attacks are the biggest killer of civilians. They drive extremism. 3 – These barrel bombs are a leading cause of displacement, forcing refugees to cross the Mediterranean and other borders. 4 – Many of the barrel bombs are dropped on areas under siege. More than half a million people in Syria live in areas with no access to food, water or medicine since 2013, including the areas of Ghouta that were targeted by the sarin gas attacks in the same year. 5 – The international anti-Isis coalition is flying in the same airspace where many of these barrel bombs are dropped, choosing to look the other way. Join hundreds of non-violent Syrian groups in asking for the international community to enforce the UN ban on barrel bombs with a Bosnia-style no-fly zone. Planet Syria is a campaign by non-violent activists in Syria to engage people around the world in solidarity to stop the violence and extremism. The intitial campaign call has been signed by 85 Syrian groups representing 17,000 people. For more information visit the website or Facebook page. That’s the title of the lead article in the current issue of Yes! magazine (see www.yesmagazine.org) by Charles Eisenstein, one of my favorite writers about economics and spirituality – and one of the opportunities we have for a wedge into the current inequitable system. “The legitimacy of a social order rests on the legitimacy of its debts,” Eisenstein says. This was okay in traditional cultures functioning on the principle of a gift economy in which “repayment of debt [not usually monetary] was inseparable from the meeting of social obligations,” but we shouldn’t assume that the “moral associations of making good on one’s debts” should apply in the current predatory capitalist economy, as its legal code and “logic of austerity” attempt to dictate. According to this “logic,” if a country like Jamaica or Greece, or a municipality like Baltimore or Detroit, has insufficient revenue to make its debt payments, it’s morally compelled to privatize public assets, slash pensions and salaries, liquidate natural resources, and cut public services in order to pay creditors. Such a prescription,” Eisenstein says, “takes for granted the legitimacy of its debts. Today a burgeoning debt resistance movement draws from the realization that many of these debts aren’t fair. Most obviously unfair are loans involving illegal or deceptive practices – the kind that were rampant in the lead-up to the 2008 financial crisis. From sneaky balloon interest hikes on mortgages, to loans deliberately made to unqualified borrowers, to incomprehensible financial products peddled to local governments kept ignorant about their risks, these practices resulted in billions of dollars of extra costs for citizens and public institutions. Going even further, Eisenstein suggests that “at a time when the law itself is so subject to manipulation by financial interests, why should resistance be limited to debts that involved lawbreaking? After all, the 2008 crash resulted from a deep systemic corruption in which risky derivative products turned out to be risk-free – not on their own merits, but because of government and Federal Reserve bailouts that rewarded the perpetrators of these ‘financial instruments of mass destruction’ (as Warren Buffett labeled them) while homeowners, other borrowers, and taxpayers were left with collapsed asset values and significantly higher debts. Challenges to these debts can’t be based on appeals to the letter of the law when the laws are biased in favor of creditors. There is, however, a legal principle for challenging otherwise legal debts: the principle of ‘odious debt.’ Originally signifying debt incurred on behalf of a nation by its leaders that doesn’t benefit the nation, the concept can be extended into a powerful tool for systemic change. Odious debt was a key concept in recent debt audits on the national level, most notably in Ecuador in 2008 that led to its defaulting on billions of dollars of its foreign debt. Nothing terrible happened to it, setting a dangerous precedent (from the creditors’ point of view). Greece’s Truth Commission on Public Debt is auditing all of that nation’s sovereign debt with the same possibility in mind. Other nations are likely taking notice because their debts, which are unpayable, condemn them to an eternity of austerity, wage cuts, natural resource liquidation, and privatization for the privilege remaining part of the global financial system” that created their suffering in the first place. Eisenstein believes “that most debt owed by the ‘developing’ world is odious, born of colonial and imperial relationships,” and says “the same might be said for municipal, household, and personal debt. Tax laws, financial deregulation, and economic globalization have siphoned money into the hands of corporations and the very rich, forcing everyone else to borrow in order to meet basic needs. Municipalities and regional governments now must borrow to provide the services that tax revenues once funded before industry fled to the places of least regulation and lowest wages. The rising tide of debt can’t be explained by laziness or irresponsibility,” Eisenstein says. It’s systemic, unfair, and inescapable. “As the concept of illegitimate debts spreads, the moral compulsion to repay them will wane, and new forms of debt resistance will emerge. They already are in places most affected by the economic crisis, such as Spain, where a strong anti-eviction movement challenges the legitimacy of mortgage debt and has just gotten an activist elected mayor of Barcelona. As the recent drama in Greece has shown us, though, isolated acts of resistance are easily crushed. Standing alone, Greece faced a stark choice: capitulate to the European institutions and enact austerity measures even more punishing than those its people rejected in the referendum or suffer the sudden destruction of its banks. Since the latter would entail a humanitarian catastrophe, the Syriza government chose to capitulate. Nonetheless, Greece rendered the world an important service by making the fact of debt slavery plain, as well as revealing the power of undemocratic institutions such as the European Central Bank to dictate domestic economic policy. Three-quarters of Americans carry some form of debt. Student debt stands at more than $1.3 trillion in the United States and averages more than $33,000 per graduating student. Municipalities around the country are cutting services to the bone, laying off employees, and slashing pensions to make payments on their debts. The same is true of entire nations, as creditors – and the financial markets that drive them – tighten their death grip on southern Europe, Latin America, Africa, and the rest of the world. If one debt can be nullified, maybe all of them can – not only for nations but for municipalities, school districts, hospitals, and individuals. That’s why the European authorities made such a humiliating example of Greece – they needed to maintain the principle of inviolability of debt. That’s also why hundreds of billions of dollars were used to bail out the creditors who made bad loans in the run-up to the 2008 financial crisis, but not a penny was spent bailing out the debtors. Eisenstein goes on to point out the limitations of marginal reform of the system (à la New Deal), saying that “reducing rates on student loans, offering mortgage relief, reining in payday lending, or reducing debt in the Global South might be politically feasible, but by mitigating the worst abuses of the system, they make that system slightly more tolerable and imply that the problem isn’t the system,” which it is. “Conventional redistributive strategies, such as higher marginal income tax rates, also face limitations, mostly because they don’t address the deep root of the debt crisis: the slowdown of economic growth worldwide, or, as a Marxist would put it, the falling return on capital. More and more economists are joining a distinguished lineage that includes Herman Daly, E.F. Schumacher, and even (though this is little known) John Maynard Keynes to argue that we are nearing the end of growth – primarily, but not only, for ecological reasons. When growth stalls, lending opportunities disappear. Since money is essentially lent into existence, debt levels increase faster than the supply of money required to service them. The result, as Thomas Piketty has described, is rising indebtedness and concentration of wealth. The aforementioned policy proposals have a further defect as well: They’re so moderate they have little potential to inspire a mass popular movement, as, for example, pushing for the cancellation of all student debt would – or a jubilee, a fresh start for mortgage debtors, student debtors, and debtor nations. The problem is that canceling the debts means erasing the assets upon which our entire financial system depends. These assets are at the basis of your pension fund, the solvency of your bank, and grandma’s savings account. To prevent chaos, some entity has to buy the debts for cash, and then cancel those them (in full or in part, or reduce their interest rate to zero). Fortunately, there are deeper and more elegant alternatives to conventional redistributive strategies. I’ll mention two of the most promising: ‘positive money’ and negative-interest currency, both of which entail a fundamental change in the way money is created. Positive money refers to money created directly without debt by the government, which can be given directly to debtors for debt repayment or used to purchase debts from creditors and then cancel them. Negative-interest currency (which I describe in depth in Sacred Economics) entails a liquidity fee on bank reserves, essentially taxing wealth at its source. It enables zero-interest lending, reduces wealth concentration, and allows a financial system to function in the absence of growth. Eisenstein is the author of Sacred Economics and The More Beautiful World Our Hearts Know Is Possible. Search this website for detailed notes on these books.